It’s almost time to set sail, but the Story Pirates have another summer bonus episode to listen to while they pack.<br>Today’s episode features two previously unreleased stories: “Silly Monster Problem,” by an author from Switzerland named Anne, and “Will Wants 300 Bucks,” by a 1st grader from Colorado named Jacob, as well as a new version of a greatest hit from last season, Star. 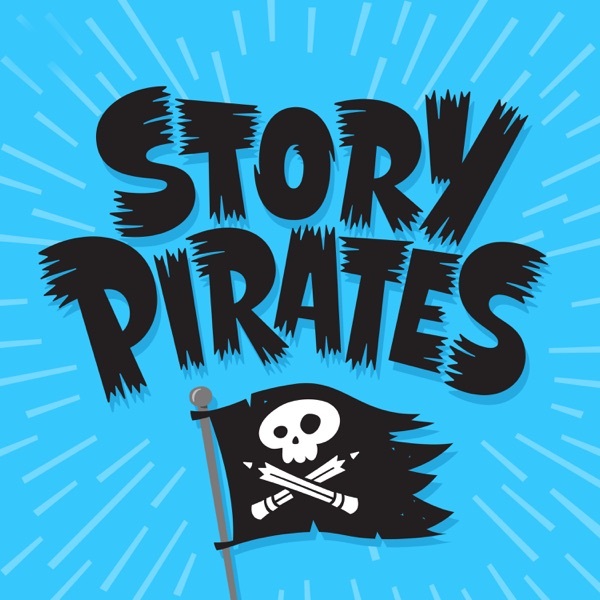 In today’s summer bonus episode, Lee visits a new part of the ship and makes a clever new friend who introduces two lesson plans that parents and teachers can use to help kids write awesome stories while they listen to the Story Pirates Podcast! “Characters With Big Dreams” will help writers create a character as spectacularly ambitious as Glitter, the guitar playing horse in the song “Nothing Is Impossible” (found in episode 12) and “Make Your Problem Huge” will help writers create high stakes problems for their characters to solve, like in the story “Triple Power” (included in this episode).<br><br>Download these FREE lesson plans today at www.storypirates.com/lessons and don’t forget to leave us feedback so that we can make even better resources for the classroom. Sure, it’s September. Sure, school has started. But summer hasn’t technically ended! At least it hasn’t for the Story Pirates, who have a new summer bonus episode just for you.&nbsp;<br>Today’s episode features a brand new story from Savi in Oregon called The Hungry Rock, as well as two greatest hits from last season, A Girl With Superpowers and The Chess Master. The Story Pirates take a break from summer bonus episodes to team up with Brains On! for a special collaborative episode. Featuring a brand new story called Dr. Weirdo and the Boring Unicorn, written by a Virginia 3rd grader named Lucyna, as well as a special Brains On! segment about why jokes are funny.<br><br>Be sure to listen our companion episode over at Brains On! for more Story Pirates + Brains On awesomeness! Question: Who has two thumbs and wants another summer bonus episode of the Story Pirates Podcast?&nbsp;<br>Answer: A cute dog. With thumbs.<br>But you can listen too! Today’s episode features some greatest hits from last season: The Person Who Could Not Spin, Sandwich Day and How To Make A Basketball Plant. The Story Pirates take a break before their big season finale for a special smash up, mash up, crossover episode with Wow in the World, all about the science of synesthesia.&nbsp;<br><br>Already listened to this episode over at Wow in the World?&nbsp;<br><br>Well, don’t miss our version, which includes an exclusive, FULL INTERVIEW with Nile, a real life kid who experiences synesthesia.<br><br>Taste words, hear colors, feel sounds? What in the world is happening in the brain when senses are scrambled? Join Guy, Mindy, the Story Pirates and an amazing new invention as they explore a mixed-up sensory world. Rolo obsesses over two entrancing sirens (Sasheer Zamata and Aparna Nancherla) who teach the Pirates about being #blessed. This week’s episode features two new stories: “The Person Who Could Not Spin,” a horn-soaked, ska-inspired party track about learning to twirl by a Kindergartener from Virginia named Dillon and “Triple Power,” the truly epic adventure tale of intrepid triplets who save their city from a mad scientist's barbeque-flavored monster, written by brothers Ben and Sam, ages 8 and 6, from the United Kingdom.<br><br>---------------<br><br>Don't forget to subscribe, rate and review the show!<br><br><br>---------------<br><br>Get ready for the summer doldrums with the first Story Pirates Book, <em>Stuck in the Stone Age,</em> by NY Times bestselling author Geoff Rodkey, and based on an idea by Vince Boberski, age 11! The Story Pirates' dream of opening a restaurant/bistro/cafe onboard the ship is put in jeopardy when Russ T. Walrus (Wyatt Cenac), a famously harsh food critic, comes to review the menu. This week’s episode features two new stories: "How to Make a Basketball Plant," a funky number about basketball’s most bizarre ritual, written by a 1st grader from Utah named Connor, and "The Clean Machine," a dramatic power ballad about a mysterious flower, written by a 6th grader from Bosnia named Izzy.<br><br>----------------<br><br>Parents, are you signed up for our newsletter? Find out when were coming to your town, exclusive bonus content, and more by signing up at StoryPirates.com<br><br>---------------<br><br>Get ready for the summer doldrums with the first Story Pirates Book, <em>Stuck in the Stone Age,</em> by NY Times bestselling author Geoff Rodkey, and based on an idea by Vince Boberski, age 11! Meghan reveals the mystery of her porpoise-full past and must heal a rift between her porpoise protege Travis (Josh Sharp) and the intimidating Mother Porpoise (Alison Pill). This week’s episode features two new stories: "George's Cheese," the tale of an easily-startled pig who wreaks havoc on an unsuspecting town, written by a 5th grader from Virginia named Micah and "Pizza Revenge," a salsa-inflected jam about a viral video that forever changes the battle between pizza and hot dogs, written by a 5th grader from Arkansas named Lillie.<br><br>------------------<br>All 8 Unicorns is now a CARTOON! Check out StoryPirates.com/Cartoons to see it!<br>------------------<br>Parents, don't forget to subscribe/rate/review the show, and tell a friend about it too! The unthinkable happens when Lee runs out of his favorite drinkable yogurt, kefir. Thankfully, Poseidon and his lesser-known kid brother Greg (Ben Sinclair) show up to lend a hand. This weeks episode features two new stories written by kids, "Evil Cockroach Nation," the shocking tale of a girl who defeats disgusting bugs and becomes a gazillionaire, written by a 4th grader from Wisconsin named Cora, and "The Guy," an old school hip hop jam about a stick figure who looooves potato chips, written by a 5th grader from California named Peer.<br>------------------<br>All 8 Unicorns is now a CARTOON! Check out StoryPirates.com/Cartoons to see it!<br>------------------<br>Parents, don't forget to subscribe/rate/review the show, and tell a friend about it too! The gang relieves their boredom by inventing a new sport, and a mysterious curmudgeon from below deck helps them play by the rules. This week’s episode features two new stories: “Going to the Moon,” the story of a girl who dreams of being slingshotted, along with her pet monkey, to the moon, by a 5th grader from Virginia named Kenya Grace, and “All Rainbow Cars,” a psychedelic trip to Rainbow Island written by a 4 year named Jeanne from New York.<br><br>The Story Pirates book is in stores NOW! Stuck in the Stone Age, by New York Times bestselling author Geoff Rodkey, is available wherever books are sold, or visit storypirates.com/book to get your copy today.<br><br>Parents, don’t forget to subscribe, rate and review the show! Lee introduces Shipcoin, the first ever Shipto-currency, to the gang; but not everyone is thrilled with the new economy on board. This week’s episode features two new stories: “The Chess Master,” a special song in collaboration with The Gregory Brothers (Songify The News) about a boy who plays chess even when the air conditioning isn’t working, written by 2nd grader from Tennessee named Luke, and “The Amazing Rake,” the tale of a two raking enthusiasts that compete in the world’s most intense raking game show, by a 5th grader from Germany named Colton.<br><br>The Story Pirates book is available NOW! It's called Stuck in the Stone Age, written by NY Times bestselling author Geoff Rodkey, and based on an idea by Vince Boberski, age 11! Stuck In The Stone Age also has a special section called the Story Creation Zone that's all about helping kids write their OWN stories! Find it wherever books are sold!<br><br>Parents, don’t forget to <a href="https://itunes.apple.com/us/podcast/story-pirates/id719585944?mt=2">subscribe, rate and review</a> the show! It’s the season finale! With the relaunch of the Story Pirates Podcast just days away Lee and Peter say thank you to all of the fans with a Story Pirates classic, featuring friend and fellow Story Pirate Kristen Schaal. This story was written by a then-1st grader named Madeline DeRoche and it’s called, “I Love You The Best.”<br><br>Also being released today is the official trailer for new season of the Story Pirates Podcast from Gimlet Media. The new season sets sail Monday, November 20th!&nbsp; For more information check out <a href="http://www.storypirates.com">www.storypirates.com</a>! In this bonus episode we're giving you a sampler platter of some of our favorite podcasts for kids.&nbsp; If you like what you hear check out apple podcasts.com/kids for more information! Peter &amp; Lee's summer hiatus continues in preparation for the Story Pirates Podcast relaunch in the fall.&nbsp; Until then the Story Pirates present a Summer Grab Bag of old classics.&nbsp; This week features two songs.&nbsp; The first is from a then-fifth grader named Chuck and it's called "The Rundown." The second is from a then-first grader named William and his story is called, "I Like Lisa." While Lee &amp; Peter prepare for the Story Pirates podcast relaunch this fall, we are releasing old favorites as part of our Summer Grab Bag series. This week's episode features two amazing stories. The first was recorded live at the San Francisco Sketch Fest. It is by a 1st grader named Hannah and it's called "I Love Babies." The second was recorded for our radio show back in 2012. It was written by then-9-year-old named Sienna, and it is called "Trip to Happy Burg."